It's been a long time coming, but on this evidence Hayden looks set to hit the bullseye with this new MoFo range. Plug in soon. Great tone and player-friendly response. Perfect for home recording and practice. Loud for its size. At this price, not much! 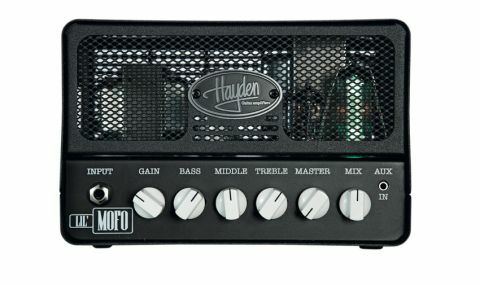 Since 2006, Ashdown - the UK brand of world-class bass amp fame - has marketed its guitar amplifier range under the name of Hayden, a unique and separate identity. It's a tough market, but Hayden has gradually been winning acclaim on both sides of the Atlantic. Here we're looking at an amp from the recently revamped MoFo range: the all-new two-watt Lil' MoFo. "It's a tough market, but Hayden has gradually been winning acclaim on both sides of the Atlantic"
First impressions are all-important and this head scores highly in the design, fit and finish departments. Top marks to Hayden for the restyling: the smart, purposeful case is folded steel with a black crackle finish that seems reasonably hard-wearing, and there's plenty of ventilation integrated into the covers, as well as a useful handgrip or two. The chassis supports oversized mains and output transformers, which, at first glance at least, would indicate good things for tone. Inside, the electronics are mostly contained on one large high- quality through-plated PCB that holds the valve bases and front panel controls. The mains switch and socket are chassis-mounted on the rear panel, and what little wiring there is has been neatly executed. In terms of its shouting voicings, the new Lil' MoFo uses a single ECC82 dual-triode valve wired in push-pull to generate a respectable two watts. In addition to an ECC83 driver, there's one other valve that's common to all of the new MoFo heads - an EM84 'magic eye'. Magic eye valves date back to the early days of radio when they were used as tuning aids, with a fluorescent 'cat's eye'- shaped display in the top of the valve that would move as stations were tuned in and out. It's generally thought that Radio Corporation of America originated the 'magic eye' name. The EM84 has a dual-bar green display on the side and featured in many 1960s domestic reel-to-reel tape recorders as a level indicator. In the new Hayden MoFos, it's reincarnated as a cool status light, with both green bars moving up and down as you hit the strings: not exactly an essential inclusion, but very stylish nonetheless. All of the new range of MoFo amps are single-channel designs when it comes to their front ends, with controls for gain, bass, mid and treble, plus an overall master volume, but the all-new Lil' MoFo features an aux input with a front-panel mix control and a handy recording out jack. Overall, this MoFo is built to last, with porcelain valve bases, quality neon-illuminated mains rocker switches, and stylish metalwork that's at least as good as anything we've seen from the competition. We tried out this new MoFo with a pair of Vintage 30-equipped 2x12 open- and closed-back cabinets, with a selection of guitars, including a Gibson Les Paul Studio, a PAF- equipped Les Paul Standard, a Fender Custom Shop Nocaster, and our regular Alnico Pro-loaded Strat. "The Lil' MoFo is not lacking in punch and is an ideal amp for home recording and practice"
While this head doesn't offer much in the way of clean headroom, it's not lacking in punch and is an ideal amp for home recording and practice. The aux in and recording outputs work well; with a little EQ, and a gate to tame background hiss you can get good results. However, a decent speaker cabinet and a pair of carefully placed microphones front and rear will get you some very respectable tones in just a few minutes, making it an ideal home studio partner. And it's loud. Plugged into a 4x12, the Lil' MoFo could force you to rethink your ideas of how powerful a two-watt amp can be. Obviously, you aren't getting much in the way of clean headroom, but with the controls up high you can still remove most of the distortion by turning down the guitar. Switching is smooth and quiet thanks to an opto-isolator rather than a relay. The MoFo's traditional bass, mid and treble controls are subtle, and interact smoothly with no annoying peaks, making the head quick and easy to fine-tune for the best results. Character wise, we have a definite British voice but with less of the midrange boxiness often associated with EL84-powered designs, making it tonally transparent and versatile. Sometimes you can plug in to a new amplifier and make an instant musical connection, as well as an electrical one. It's almost as if you can get what you want from it without a struggle, while the amp responds the more you dig into it. The new MoFos have that elusive blend of great tone and dynamic response, combined with good looks and well above average build quality. Pricing is very competitive and we think this new Hayden has got what it takes to succeed in a market sector awash with steel-cased, medium- and low-power heads. There's very little to grumble about and for grab- and-go use this head is excellent.